Dymola has come out on top in a recent ICCT report prepared by Ricardo. The report which looked at vehicle simulation tools can be found at http://www.theicct.org/evaluation-vehicle-simulation-tools. 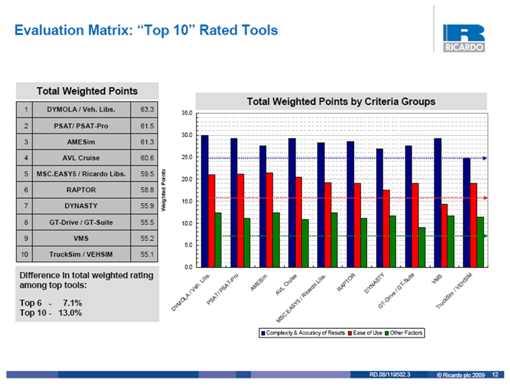 The report evaluated 19 tools: 40% were based on MatLab/Simulink and the remaining were based on the Modelica language or C/C++ or Fortran. The tools were evaluated on 14 criteria by industry users. As regulators in the United States and elsewhere begin to design heavy-duty vehicle fuel economy standards, the ICCT is exploring technical and regulatory design issues related to developing and implementing those standards. This report evaluates available vehicle simulation tools that could be used in verifying compliance to a fuel economy or greenhouse gas standard. The ICCT, established 2001, was formed when 18 air quality regulators and experts from China, the European Union, France, Germany and the United States published a consensus document on preferred government policies for shaping the future of motor vehicle technology and transportation fuels. The Bellagio Memorandum on Motor Vehicle Policy (available below in five languages) provides a guide for policymakers advancing the transition to clean vehicles and fuels and for automakers and oil companies working to develop products for the coming decades. The document continues to guide the activities and research of the ICCT, which has grown to include members from most of the world’s top 10 vehicle markets.